Ed-Data, an Internet site that provides a wealth of accessible education information, has updated financial data on districts, schools and county offices of education. Ed-Data offers a graphic breakdown of spending by major categories for every district and county Office of Education. 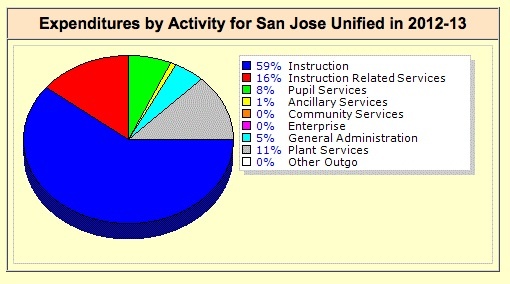 This is for San Jose Unified in 2012-13, the latest year available. The new information provides a breakdown by spending categories and enables comparisons with other districts. The site also offers per-student spending information and data by revenue sources as well as explanations of recent policy changes, including the Local Control Funding Formula. The updated information is for 2012-13, the last year that the state funded schools under the old system, which was based on revenue limits for general spending and dozens of categorical funds for restricted purposes. This year, the state switched to the Local Control Funding Formula, starting the move toward uniform level funding for all districts with extra dollars based on districts’ enrollment of low-income students, English learners and foster youth. Many of the accounts for categorical funds will disappear, since districts now have more flexibility in determining how to spend money. Nonetheless, the 2012-13 financial data is important, for it provided the base revenue levels used to determine how much each district is entitled to receive in the transition to full funding under the new formula. The comparison tool is particularly powerful, letting the user determine which districts and what factors to choose. For example, you can compare Oakland, Sacramento City, San Juan and Garden Grove – four districts with similar enrollments – in terms of how much revenue they receive per student and how much of that goes toward teacher salaries and benefits, other pupil services, and books and supplies. There are many other permutations. Ed-Data is a partnership among the state Department of Education, the Fiscal Crisis and Management Assistance Team, which is a state agency, and EdSource. Unfortunately, from what I can see this site does not have data on how much of our tax dollars local education agencies are spending to hire attorneys to fight parents over the provision of special education services. Or attorneys who fight with any parent over any educational issue for that matter. Anybody know where that sort of data can be found? CDE says it doesn’t collect it, that we have to go to each and every district to get it. Hmmm. A few years ago, as the result of an annual audit of K-12 education agencies, Californians Aware, The Center for Public Forum Rights confirmed the lack of available data resulting from the unwillingness of LEAs to share such information as required by the Brown Act. http://calaware.org/audits/2011-state-agency-follow-up-audit. Also, EdWeek recently reported on a survey that was conducted on behalf of the Education Writers Association which found that many education reporters believe public information officers for school districts and education groups often put up barriers to the free flow of information, including such financial data. So they share what they want us to see, but not what they don’t. In other words, reader beware. I’m not clear on the “other outgo”, but the difference in the instructional support and administration has to do with the special ed budget which is administrated through the county office. SFUSD is unique in that it is both a unified and county office. But sometimes the reporting can be skewed and hard to read as a result. I also see that SFUSD has a very large “other outgo” and that the “instructional services” are much smaller than the average. I think that at least one or both or the larger numbers is the result of the cost of the Superintendent Zones and that “instructional services” therefore have to be commensurately a smaller piece of the pie. If this is the case it explains what I have been saying – that the cost of the Superintendent Zones has been at the expense of the rest of the district, buyt then… I guess that was obvious from the get-go. I never saw it laid out before in black and white. I agree with Don. It’s a smoking gun. Now we know how much suffering the rest of us go through to accomodate this SZ plan. I’d be for it if it got results, but it seems to be about as useful as asking Leland Yee to consider a law based on it’s morality. John, would you be able to shed any light on why San Francisco Unified would have an Instructional Supervision and Administration (Function 2100)cost of 14% relative to a 4% average? I looked at many districts and found none anywhere near this high. Does this mean SFUSD has a much higher cost of administration than other districts? It always claims it is lower. I don’t know enough about how to read these categories to make any general assumptions about a meaning to be derived in regard to overall district administrative costs. SFUSD has always seemed like a top heavy district. Is this indicative of that? Thanks for this useful information, John! Accurate comparisons between districts are impossible because teacher experience and education distributions, not just salary scales, determine the average salary. My other question was whether any salary data are reported at the school level, and if so, whether actual per-school costs or percentages of total district costs (FTE teachers in school / FTE teachers in district * total district teacher payroll) are reported. I didn’t find any school-level salary data in my cursory search, but I would caution that if such data appear, they are probably not meaningful either. Here again, teacher experience and education distributions vary from school to school. I would guess that average teaching experience in conjunction with average teacher salary would act as a fairly good proxy for the teacher distribution on the salary schedule. It’s true that there are cases where experience does not map to schedule position and that when the schedule is two dimensional (always? ), it obfuscates things further. I would add that pre-k teachers sometimes use the same schedule but may be limited in how far they can progress in the step or class axis. Because salary information has been made public it should be possible to calculate the distribution. That said, it would be immensely more useful if districts published schedule distributions. My guess is they are required to maintain that internally anyway. These may even already be reported to bargaining units. The devil’s in the details, as we’re both saying. Though salary and its inputs are public information, one is much more likely to get a seniority list than a list showing years of experience for salary placement — because seniority lists are needed for layoffs every spring, even in years when no salary negotiations occur. Years of seniority is different yet again from years of experience for salary placement. The second, horizontal dimension of the salary grid adds a great deal of uncertainty. In my local district, salaries of teachers new to the profession differ by as much as $7,736.43, depending on academic units and before including fixed stipends for *completion* of graduate degrees. (I was a relatively expensive teacher at a time when there was a huge teacher surplus, and I’m sure that this fact was not lost on district-level administrators, who have no knowledge of the contributions made by individuals. Obama, Duncan, and a slew of reformers favor setting salaries without regard to teachers’ educational attainment.) For a maximum-experience teacher in this district, the spread rises to $25,785.41! And unit count definitely varies differently than years of experience. Other than for layoff tie-breaking purposes, I’ve never seen a district provide a readily-accessible list showing academic credit. At that, credit allowed for local tie-breaking purposes is not necessarily the same as credit allowed for salary placement. I wish that districts, and data aggregators like Ed-Data, would report the averages of these inputs, so that we could make truly accurate claims about teacher salaries. Although districts obviously need to keep track of the information, my guess is that much of it lives in paper files, with the salary row and column, but not the inputs, entered into the payroll system. In the last district where I taught, I received a verification form with handwritten (!) experience and credit figures every year. Paul, good questions. I don’t know what data must be sent to the state, but I am sure the Ed-Data folks will read your suggestions. I agree that a disclaimer would be useful. School-level reporting of salaries have been a huge point of contention with the equity community as you know, since veteran, higher-paid teachers tend to teach in higher-performing schools. As a result the average salary in low-income, low-performing schools is usually lower. Groups like Ed Trust-West and other advocates of school-site budgeting want real school site salaries used so that it’s apparent how resources in a district are distributed. Most districts will resist this. And fwiw, I’ve also seen some of the ‘best’ teachers actively choosing against the highest performing schools in diverse districts. Didn’t mean to suggest districts assigned teachers in this fashion, navigio. To the contrary, it’s a matter of choice, where veteran teachers choose to teach. And yes, there are plenty of experienced teachers committed to Title I schools — but the overall distribution doesn’t show that. It will be interesting to see if districts direct supplemental and concentration dollars under the Local Control Funding Formula to add resources to schools with English learners (supplies, planning time, longer day with additional staff) to attract and retain veteran teachers. That is one of the intentions of the law. Is there an independent source for Superintendent salaries? The figure quoted by Ed-Data seems too high for our district. Which page is superintendent salaries on? There was a line item for our district called Superintendent and Board. Clicking on that item gave a breakdown of how much for the Board and how much for the Superintendent. Ok, that line item includes more than just superintendent salary. Sometimes it even includes the salary of more than one person. Nb most superintendents also get allowances that are considered compensation on top of their salary (eg business dinners/lunches, car, gym, etc). IC, devils in the details. Too bad those aren’t available.